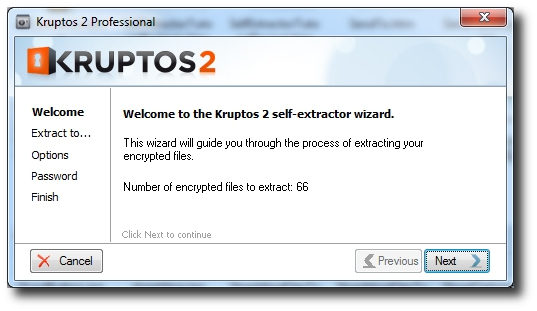 Kruptos2 Professional allows you to create encrypted email attachments so you can email your sensitive documents to anyone who has a Windows based computer. Your recipients do not need to have Kruptos 2 Professional installed all they need is the correct password to gain access to your shared documents. Kruptos 2 Professional encrypted attachments utilise the same power behind self-extracting files so you can be sure your files are secure. 6.Your encrypted attachment file will now be created. 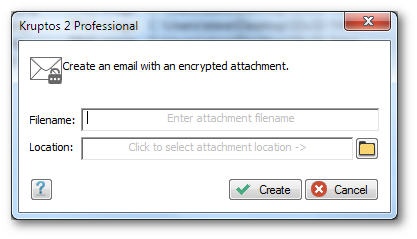 You can now choose to attach your encrypted attachment to new email or to attach later. If you choose to attach now Kruptos 2 Professional will attempt to open your default email client and create a new email with the attachment. c) Add the encrypted attachment to your email. 7.Your encrypted attachment file will now be created. You can now choose to attach your encrypted attachment to new email or to attach later. If you choose to attach now Kruptos 2 Professional will attempt to open your default email client and create a new email with the attachment. 7. The contents of the Self-Extracting file will now be extracted and decrypted using the provided password.